The City of Potosí was founded in 1546 as a silver mining town, which soon produced fabulous wealth, becoming one of the largest cities in the Americas and the world. It is from Potosí that most of the silver shipped through the Spanish Main came. According to official records, 45,000 tons of pure silver were mined from Cerro Rico from 1556 to 1783. Of this total, 7,000 tons went to the Spanish monarchy. After 1800 the silver mines became depleted, making tin the main product. This eventually led to a slow economic decline. The site includes the colonial city center and the industrial heritage more close to the mountain, among which are dams, smelters and ore-grinding mills. The approach to Potosí is magnificent - the road from Sucre already is a fine drive of 2.5 hours mostly on the Altiplano, but the first sight of the Cerro Rico (where all Potosi's riches came from) is truly exciting. There have been reports over the last few years that it is in danger of collapsing totally because of over-mining, but it still seemed to be a very sturdy mountain to me. It completely dominates the compact city beneath it. 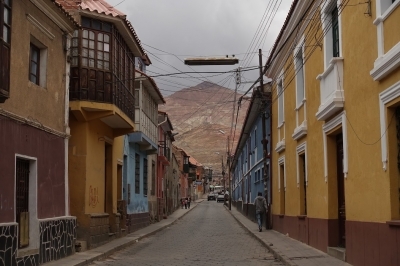 As in Sucre, opening hours to the sights of Potosi are fairly limited and unreliable. I had left Sucre early to be able to visit at least its main attraction - La Casa de la Moneda. This former Mint is now set up as a museum, displaying both parts of its former use and miscellaneous exhibitions on art, archeology and geology. One of its prize pieces is the 18th century La Virgen del Cerro, a work of the Potosi school depicting the whole (partly mythical) story of the Cerro Rico. I had decided against visiting the interior of one of the mines early on - too claustrophobic for me. So I just wandered about in the fine colonial city center, sat on its main square, visited the bright Santa Teresa Monastery and even meandered into the outskirts of the city to have a look at one of the former smelters, the Ingenio San Marcos. Knowing the city's history, it's an impressive place to visit. Though as with all other sites in Bolivia that I have visited so far, it lacks the really outstanding surprises that turn a WHS-visit from "good" into "great". Getting to Potosi had been a dream of mine ever after having visited some of the silver mines of Mexico. Potosi was the largest silver mine of the Spanish empire and its crown jewel. To this day "Vale un Potosi" is a standing expression in Spanish for "worth a fortune". The Potosi mine was a gruesome place. The high altitude of the mine at 4000m made the already terrible working conditions of a 16th century mine even worse. Similar to other parts of the Americas they tried using African slaves, but they tended to die off too quickly in the high altitude. So the work was mostly done by the local native Americans. To this day the Potosi mines are a pretty dangerous places for miners. And for visitors. So you should consider if you want to join a tour. I decided against it and spent my time visiting the old town. The most notable structure in town is the royal mint, the casa de la moneda. I would recommend joining a tour to get a feeling for the site and the silver processing. Personally, I enjoyed the Mexican silver towns better. Potosi is a historically important site and deserves inscription. It just isn't the nicest example of the type of town. And it lacks the quirkiness of my personal highlight, Guanjuato. I came by bus from Uyuni having also ticked off Pulancayo (T). If you are in the area a visit to the Salar de Uyuni is a must. I left by shared cab to Sucre. You have to join a tour to get into the mines of Cerro Rico. When I got to the assembly point I was told that the other tourists that were supposed to join the group didn't show up (heard that they were drunk, LOL) so it left only me in the tour. Even it's only me but the tour still kept on, so I was like a VIP. We got into a small van and went to a place to suit up. We were provided with a helmet with a torchlight, hand gloves, boots, a thin jacket and pants. Then we went to the miners' market. As the 3rd generation miner and an ex-miner, my guide Antonio explained well to me about the history of Cerro Rico and the real miner story of himself on the way to the market. When we arrived at the miners' market, we bought some water and coca leaf for the miners. Since it's one on one, Antonio told me a lot of extra things about the usage of coca leaf for the miners, like how they could work whole day with just eating coca leaf and how to heal themselves with coca leaf. We went to see the city of Potosi and Cerro Rico as background at the mirador (lookout point) Then the journey into the mine tunnel started. Since I was the only one, Antonio brought me to his former working place Minas de San Miguel. It's a bit different from the touristic mines as this is still a functioning mine and it requested a bit of climbing up and down. Strongly suggest taking a mask with you as it's a bit dusty down there when the workers operated. We went to 4 different levels and got to meet 3 workers. It's quite shocking getting to know that they worked day and night without much rest. Antonio brought me to the so called "museo" to see some figures of Spaniard and African worker. At the same place also got the biggest "El Tio" in Cerro Rico. Antonio also shown me different types of minerals harvested in the mine. The journey took around 3 hours. It's really a special experience to see how a mine works from the Spaniard era till present day. And especially from the mouth of an ex-miner telling the difficulties they are facing at the moment. If you want to experience something different, this is it. 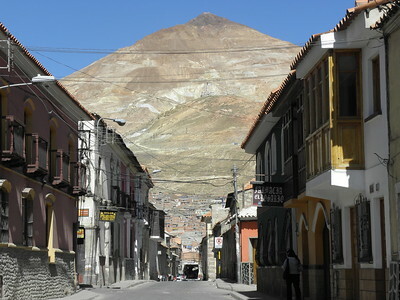 As a Bolivian I am so proud that Potosi has been declared a World Heritage site. At the height of its splendor it is said to have rivaled London, Paris and Madrid in it's population size. It is also written that for some religious procesion the streets where paved with silver ingots that just poured out of "Cerro Rico" and which later where exported to Spain. Aqueduct: "industrial monuments of the Cerro Rico, where water is provided by an intricate system of aqueducts and artificial lakes"
Liquid Mercury: Became a massive producer of Silver because of the transport of Mercury from Huancavelica - The "Patio Process" of silver amalgamation replaced the previous method of extracting silver from its ore by smelting but required mercury at the rate of 2 to 1 unit of silver production. "Colonial cinnabar mining and refining began in Huancavelica, Peru, in 1564. With a local source of mercury, the amalgamation process was adopted to refine silver in Potosí, Bolivia, in the early 1570s..According to our calculations, between 1564 and 1810, an estimated .....39,000 metric tons were released as (mercury) vapor during silver refining operations in Potosí." Slavery: "To compensate for the diminishing indigenous labor force, the colonists made a request in 1608 to the Crown in Madrid to begin allowing for the importation of 1500 to 2000 African slaves per year. An estimated total of 30,000 African slaves were taken to Potos? throughout the colonial era. African slaves were also forced to work in the Casa de la Moneda as ac?milas humanas (human mules). Since mules would die after couple of months pushing the mills, the colonists replaced the four mules with twenty African slaves." Mints: La Moneda, a mint established in 1672 to coin the silver. The WHS is also explicitly linked to the economic change brought in the 16th century by the flood of Spanish currency resulting from the massive import of precious metals. Charles V: first called "Villa Imperial de Carlos V"
Mercedarians: Iglesia Na Sa de la Merced "The Order of Mercy was expanding very rapidly and during the sixteenth century, it established convents in .. Potosí (1549) .."